nostalgic too.The name itself tickles my taste buds,I have had this halwa couple of times from one of my friends who was a native of Thirunelveli(Nellai).Her vacation trip to home always ended with a pack of halwa for us too.I will not say that this halwa tasted exactly the same but my hubby rated this on a ten rating scale and gave a seven.Not bad,huh? ?The color and texture was perfect but the ghee wasn't overflowing.I compromised the ghee just to reduce the caloric load.So,when you prepare this halwa,do use the 3/4th cup of ghee.This is a time consuming halwa but its worth to try once in a while.This halwa can be prepared with wheat flour too but the consistency and texture is doubtful.Try if you like it or make it for Diwali or if you are craving for some Thirunelveli halwa. For more Diwali sweets,check out this link here. Wash and soak the wheat kernels overnight or 8 hours.Reserve half cup water and drain the rest.Grind in a mixer until smooth.Strain the mixture in a tea strainer.Again add the strained mixture in the sieve to the blender and add 1/2 cup water.Grind again until smooth and repeat the process of straining.Squeeze out any residual liquid and throw that strained residue away.Leave the collected wheat milk undisturbed for half to one hour(Use a bowl from which you can drain the water easily,I used a glass bowl).Now,drain the excess layer of clear water formed on top of the undisturbed milk after 30 minutes to one hour without draining away the main contents. Break the cashew in bite size pieces.In a heavy bottomed pan,add a tbsp of ghee and fry the cashew nuts until slightly browned.Drain in a plate. 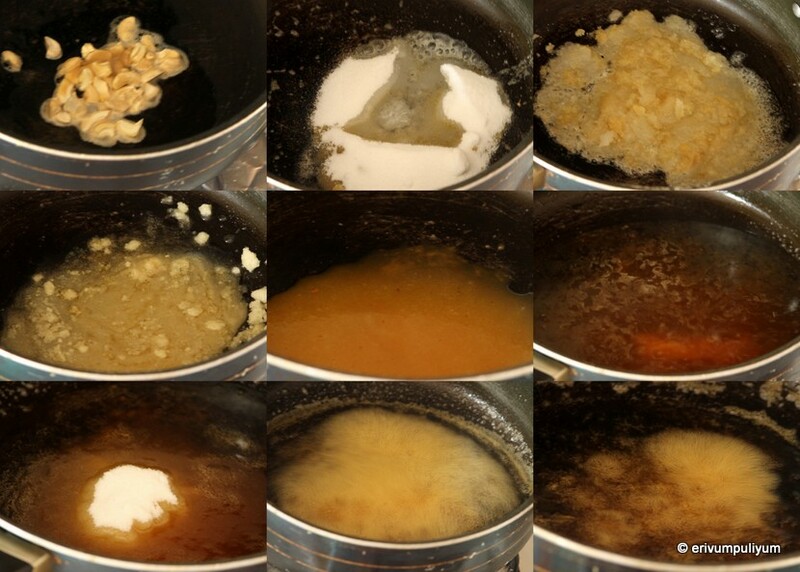 In the same pan,add half cup sugar and a tbsp of water.Keep flame on low medium.Wait till the sugar starts to melt then become dry and then melt again.At this time the sugar starts to caramelize,reduce flame to low(else sugar gets burnt) and wait till the sugar syrup turns golden in color.Immediately add a cup of water,slowly as there may be splutters and the sugar tends to harden too.Continue to stir with a long wooden spoon(be very careful as there are chances of getting burns) until the sugar is completely dissolved and looks like a colored syrup. At this point,add the remaining sugar and stir until the sugar is dissolved.Continue to boil until you reach a one string consistency. (One string consistency means when you wipe a little sugar syrup in your thumb and pull the syrup between your thumb and index finger ,it forms a string consistency). 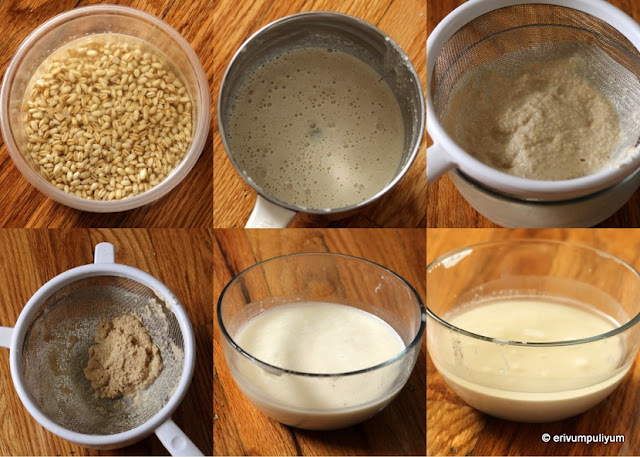 Pour the wheat milk gradually at this point and keep mixing on low flame else the milk gets cooked in lumps. Now add ghee 1tbsp at a time,and keep mixing with the wheat milk.Add a tbsp each time until the ghee gets absorbed with the halwa mixture.The halwa mixture gets cooked with ghee and it may take around 20-30 minutes for the halwa mixture to get ready.Keep stirring and at a point the ghee may not be absorbed any more and at that point you can stop adding the ghee. 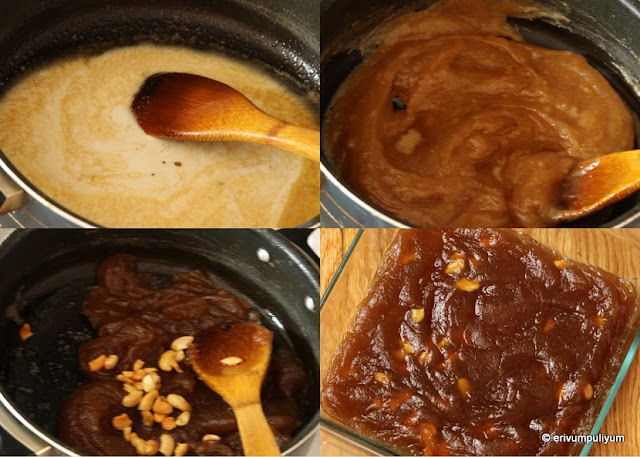 Keep a tray or plate greased with ghee ready.In the cooking mixture,add fried cashew nuts at this point and mix well.Now,keep stirring until the mixture coats the ladle or spoon and roatates freely in the pan.But don't switch off the flame then and continue to cook until you see the halwa turns slightly pale in color.Switch off flame then and pour in the greased plate/tray and wait to cool. Cut in slices or serve in a bowl just like that is totally your preference. * The recipe is adapted from here and I haven't tweaked much except reducing the ghee to half cup.But please don't reduce the ghee much as you may not get the authentic taste and flavor. * I have used haleem wheat kernels but the original recipe uses sambai wheat kernels. * The one string consistency must be carefully watched,if you don't get this right at the point you may not get halwa as the end product. This is my favorite halwa, bookmarked this..
Oh yum! Love these sweet and chewy slices! Looks so delicious.. yummy halwa..
Looks so yum Julie!! Never thought that it was made out of whole wheat kernels. Dear Julie, to me, this recipe is new, but while I was reading the ingredients and have noticed that I have to bookmark it. Despite all the hard work, the end result looks amazing... Bookmarked! A tasty Halwa and it is one of my favorite :) I looks so glossy and has got perfect texture too. looks super yumm....feel like having it right now.